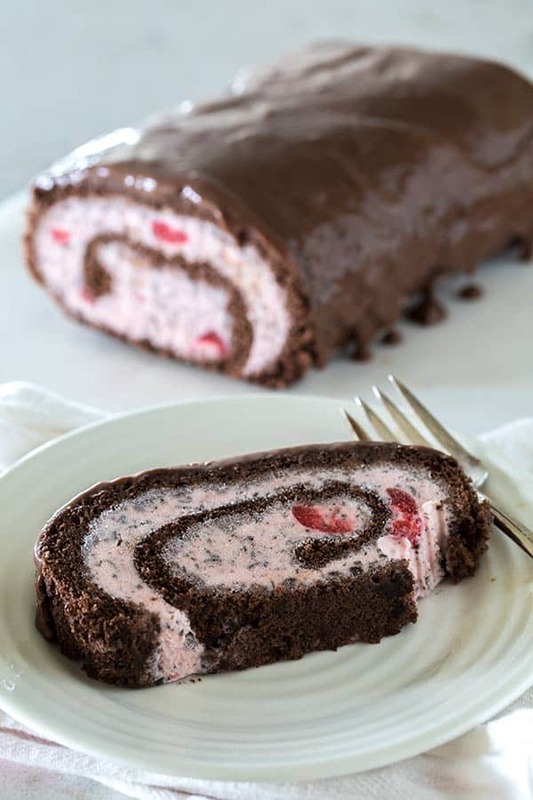 A fun-to-make, fun-to-eat Cherry Chocolate Chip Ice Cream Cake Roll dripping with chocolate ganache. A perfect summer dessert. One of my favorite desserts to serve at a summer party is an ice cream cake roll. They’re always a hit and you can change them up with any flavor ice cream you love. My family is crazy about Cherry Chocolate Chip Ice Cream. Their favorite Cherry Chocolate Chip Ice Cream is the Private Selection Brand from Smith’s (Kroger.) They love that it has more cherries and more chocolate throughout – plus it’s rich and creamy. The chocolate sponge cake is made from scratch but there’s only seven ingredients and it’s easy to make. You want a sponge cake so it’s soft enough to roll up. You’ll need a jelly roll pan to bake it in. But they’re great for baking cookies as well. I’ve created a video to show you just how easy making a Cherry Chocolate Chip Ice Cream Cake Roll really is. Have fun! 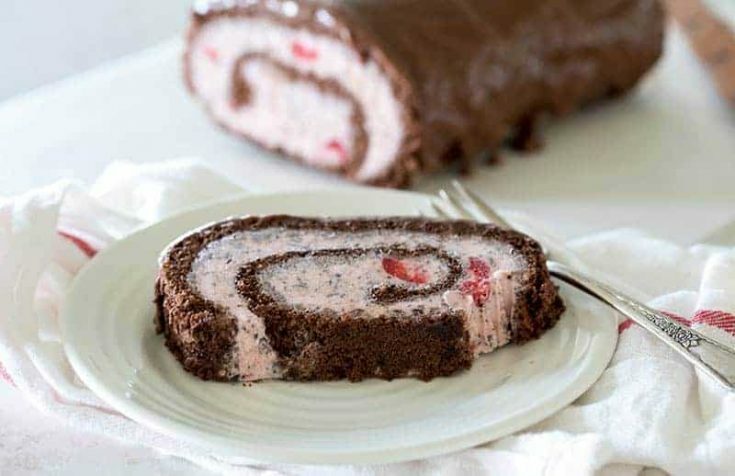 A fun-to-make, fun-to-eat Cherry Chocolate Chip Ice Cream Cake Roll dripping with chocolate ganache. Heat oven to 375º. Spray a 15 1/2 x 10 1/2 x 1-inch jelly-roll pan with cooking spray, line with parchment or wax paper and spray paper with additional spray. In a small bowl, combine cake flour, cocoa powder, baking powder, and salt. Separate egg whites and yolks into 2 large bowls. Beat yolks with the remaining 1/4-cup sugar and extracts until thickened, about 3 minutes. On low speed, beat in flour mixture until blended. Stir in 1/4 of beaten egg whites into mixture. Fold in remaining whites. Spread in prepared pan; smooth top. Bake 12 - 14 minutes or until top springs back when gently pressed. Let cool 2 minutes on a wire rack. Dust a clean towel with confectioners' sugar; loosen edges of the cake from the pan and invert cake onto towel. Remove pan; carefully peel off parchment. Starting from the short end, roll up cake in towel; place seam side down on wire rack; cool completely. While cake is cooling put ice cream on the counter to soften. When ice cream is softened, unroll cooled cake and spread evenly with ice cream. Roll up cake. Wrap tightly in parchment, then in foil and freeze, seam side down, overnight until firm. In a small saucepan, heat cream, chocolate, and corn syrup over low heat until chocolate is melted and glaze is shiny and smooth, 1 to 2 minutes. Stir in vanilla; cool to room temperature. Unwrap cake; trim ends. Place cake on a wire rack over a tray or waxed paper. Pour glaze along top of cake roll, spreading with a spatula to cover sides. Freeze cake uncovered until glaze is firm about an hour. Hi, I just made this Ice Cream cake roll with Strawberry Ice Cream without the glaze and it was more than perfect. My kids and wife enjoyed it. My son has already asked to make this cake for his birthday. Thanks very much for a great idea and recipe. Additionally, I made a chocolate dip to put on the cake that turned into a chocolate crust that further added to the fun. All this made a perfect Saturday night for us. Thanks. This sounds incredibly delicious, I can’t wait to try it. Thanks Steve! Let me know how you like it. Thanks Carol – sounds like it’s definitely time of make a cake roll again. Mint chocolate chip is one of my favorite flavors too.